The auction will take place on Wednesday, February 17 and Thursday, February 18. Sale will be held on site theatre style and via simulcast live online! 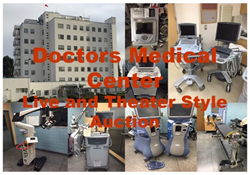 Centurion Service Group is very excited to bring to you the live simulcast auction selling an impressive catalog of over 2500 lots of used medical equipment and over 200 lots of non-medical items. Centurion Service Group is the innovative company behind the world's largest used medical equipment auction house. They empower buyers to purchase from the largest inventory, with no minimum or maximum restrictions, and a fast and easy auction process. This auction will take place in San Pablo, California on Wednesday, February 17 & Thursday, February 18 starting at 9:00 am PST both days. There will be online and on-site bidding. Registration information and the complete list of medical equipment can be found HERE! For more information on this auction or upcoming auctions, please visit centurionservice.com.